Nordic Walking is low impact and yet provides a highly effective workout – burning more calories and working more muscle groups than regular walking. 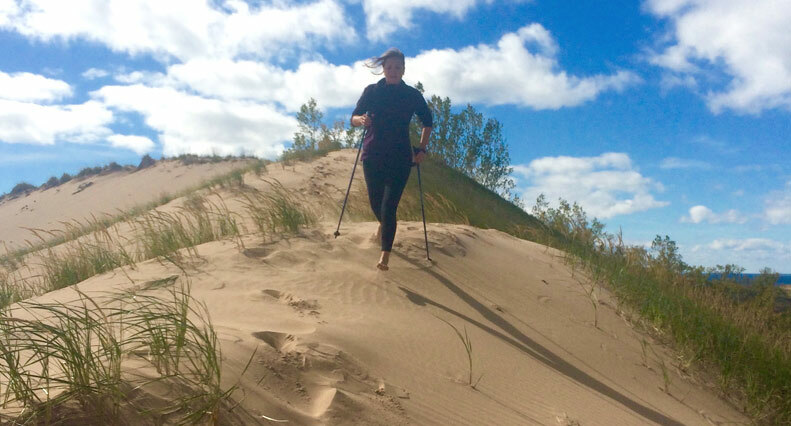 Unlike regular walking, running, and biking, Nordic Ski Walking really works the arms, shoulders, and abs. Nordic Walking includes all of the positives about walking with hand weights, but none of the negatives. 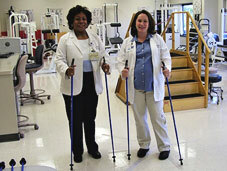 Our Nordic Walking Poles can be used in a number of ways to enhance your daily workout. Add Nordic Walking pole to your normal walking routine and you will burn up to 40% more calories and produce up to a 46% increase in energy consumption. Nordic Walking Poles can also be used while running. Running with Nordic Walking Poles will help build strength in your upper body by working your arms, shoulders and abs during the workout. Top ski racers across the world also use Nordic Walking Poles while hill bounding. Hill bounding (just bounding up hill with Nordic Walking Poles) is highly effective in building strength and speed. The American Nordic Walking System only sells Nordic Walking Poles that are tough enough for world class athletes to pound and push. Skiers and other athletes would destroy cheap/flimsy collapsible poles. Plus they rattle, vibrate, gradually collapse or fail altogether unexpectedly. quality one-piece poles that are sized correctly will always prove to be safer, lighter, stronger, more durable and much more user-friendly. At http://www.skiwalking.com/ and the American Nordic Walking System we offer 32 different lengths of quality one-piece SWIX and EXEL Nordic Walking Poles. We offer all customers a Perfect Length Guarantee, 100% Satisfaction Guarantee and a LifeTime Breakage Guarantee. The ideal length for Nordic Walking Poles is when standing tall, strapped into the comfortable fingerless glove type straps and the poles are perpendicular to the ground your elbow should be at about 90 degrees and forearm parallel to the ground.